I just completed my first instructable (tutorial for those who aren't familiar with the website). The tutorial I decided to use as my first instructable was to show how to tie the Unique Germ Grenade which I posted previously. So if you're interested in viewing the tutorial, this is the link. 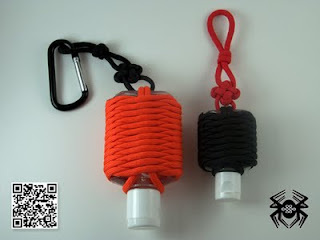 I posted the tutorial to enter a contest that they are currently having for tying paracord. If you have a tutorial for tying paracord then you should enter it, who knows, you might win. UPDATE: My Instructable has been chosen as a Finalist in the Paracord Contest! How many OZ is that bottle? It's been so long since I've tied one of these that I can't recall, sorry.